Although it’s not *that* new an idea – it actually goes back as far as 2011. SHARING LINKS VIA sound may sound like a weird way to do things, but while sharing a link via the web is easy, doing the same thing in person is pretty difficult. In this case, sound is seen as the answer and is the basis for a new Google Chrome plugin. Named Tone, the service uses your laptop’s speakers to share links from one laptop to another, provided they’re within hearing distance. Think Apple Airdrop but on a smaller scale and you have the right idea. It’s experimental so the possibility of it not working is high, and it’s really designed to be used with laptops within the same room such as if you were in a meeting. Yet this is much like another UK startup, Chirp, which offers a similar service, but also allows you to share via your smartphone. It’s been around since 2011 and is currently on a crowdfunding campaign to raise £400,000 (€560,000). It has £241,790 (€338,000) so far with 35 days to go until its campaign ends. It also has a Chrome version (it too is in beta) and in its description, it had this to say about its new rival. We were pleasantly surprised yesterday to hear of the launch of Google Tone, a plugin for Chrome that… sends data as sound. This idea will be familiar to Chirp fans everywhere. Naughty Google: Tone is a clone. Email “Google's new idea will let you send links by sound”. 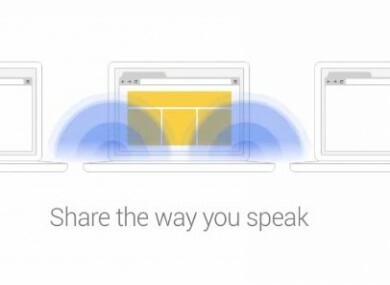 Feedback on “Google's new idea will let you send links by sound”.